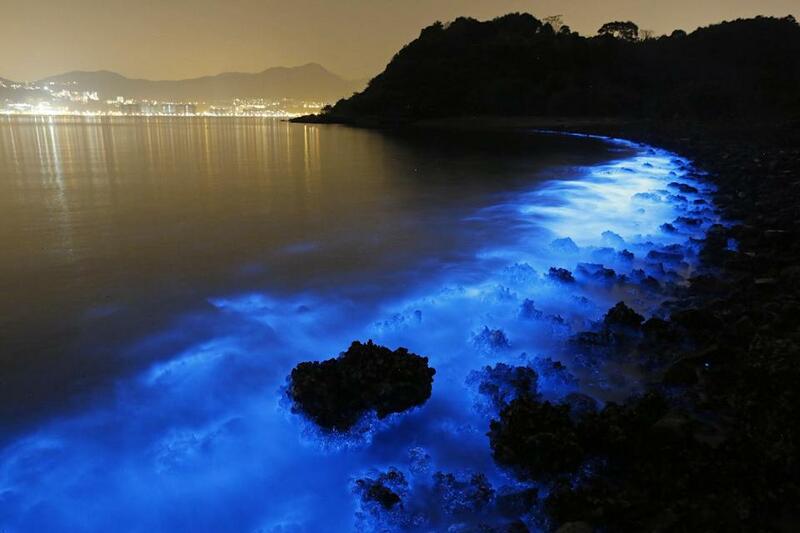 Eerie fluorescent blue patches of water glimmering off Hong Kong’s seashore are magnificent, disturbing and potentially toxic, marine biologists say. The glow is an indicator of a harmful algal bloom created by something called Noctiluca scintillans, nicknamed Sea Sparkle. It looks like algae and can act like algae. But it’s not quite. It is a single-celled organism that technically can function as both animal and plant. These type blooms are triggered by farm pollution that can be devastating to marine life and local fisheries, according to University of Georgia oceanographer Samantha Joye, who was shown Associated Press photos of the glowing water. "Those pictures are magnificent. It’s just extremely unfortunate that the mysterious and majestic blue hue is created by a Noctiluca," Joye wrote in an email Thursday. This is part of a problem that is growing worldwide, said Joye and other scientists. Noctiluca is a type of single-cell life that eats plankton and is eaten by other species. The plankton and Noctiluca become more abundant when nitrogen and phosphorous from farm run-off increase. Unlike similar organisms, Noctiluca doesn’t directly produce chemicals that can attack the nervous system or parts of the body. But recent studies show it is much more complicated and links them to blooms that have been harmful to marine life. Noctiluca‘s role as both prey and predator can eventually magnify the accumulation of algae toxins in the food chain, according to oceanographer R. Eugene Turner at Louisiana State University.